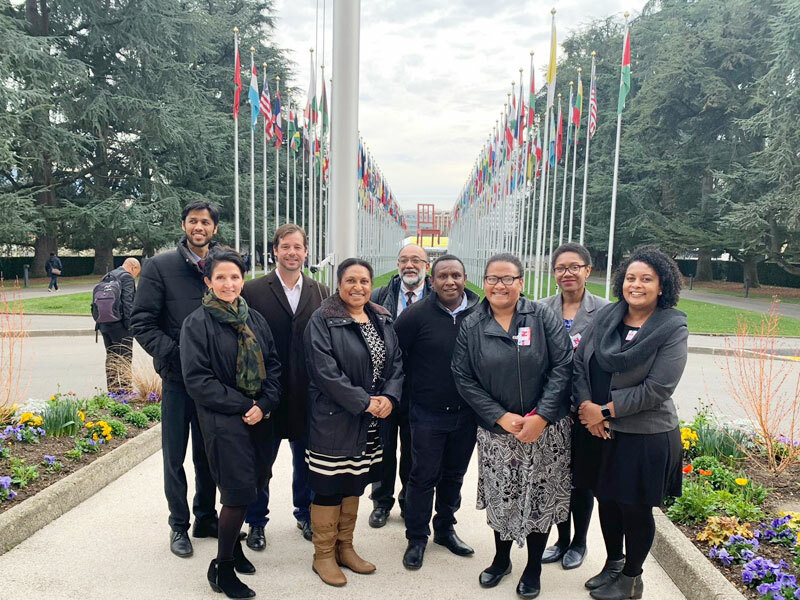 This year at the United Nations Human Rights Council in Geneva, the Commonwealth Human Rights Initiative (CHRI) is collaborating with activists from the Pacific nations of Fiji, Papua New Guinea and Vanuatu to bring to the fore human rights issues in their countries. These activists are working as CHRI fellows to understand processes, connect their field experiences with policy issues at the international level and report back to civil society groups back home. CHRI also sponsored the delegates' visit to Geneva. 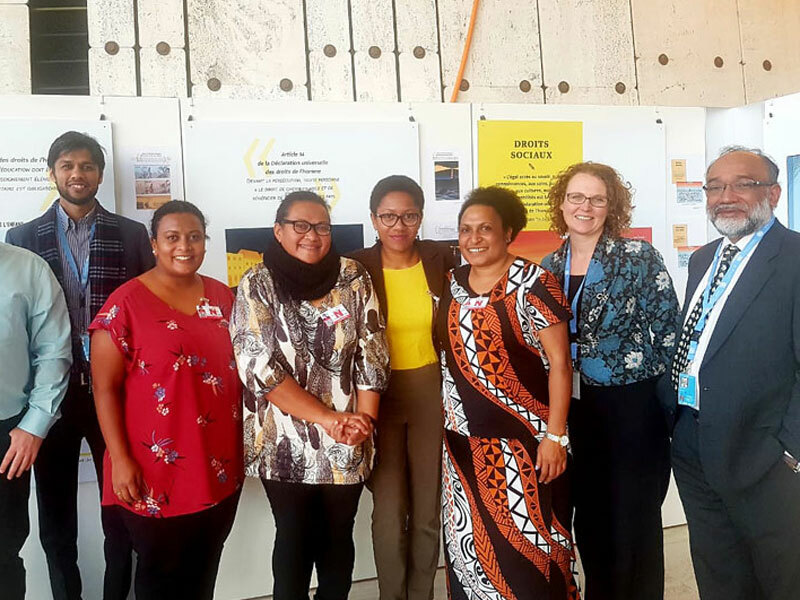 [Pictured above: Yashasvi Nain, lead, CHRI's International Advocacy Program; Ruth J Kissam, director of operations at Papua New Guinea Tribal Foundation; and Ms. Lusia Lagjilevu, legal researcher, Ms. Vilisi Ghdolo, researcher, Ms. Louchrisha Hussain, programmes, from the Citizens' Constitutional Forum in Fiji, meeting with Mr Sanjoy Hazarika, International Director, CHRI (far right) and Yashasvi Nain, lead, CHRI's International Advocacy Program, IAP (far left)]. Representatives from these Civil Social Organisations also made a rare appearance at the and called on their governments to abide by their national and international commitments to rule of law, citizens rights especially to freedom of expression, assembly and gender equality. On March 12, Ms. Lusia Lagjlevu, legal officer at the Citizens Constitutional Forum (CCF) in Fiji read a statement to a packed and attentive audience in the imposing main Council hall on CHRI's behalf. Ms Lagjlevu's statement called upon Fiji to swiftly implement the Convention against Torture (CAT) which it ratified in 2016 and urged Papua New Guinea to institute a National Human Rights Commission and crackdown against continuing “Sorcery Accusation Related Violence" (SARV) with upto 7-10 cases every week of SARV there. "We urge the government to enforce existing laws and prosecute both perpetrators and instigators,” the statement said. The Vanuatu civil society was concerned by accounts of violence against women and “sub-standard correctional facilities”. You can read the full text of the oral statement here or watch it below. More information on this statement can be found on this page of our website.